Reviewed 11/07/2013 by Joe K.
Based on Butch Ball's custom design, this knife is Benchmade's first entry in the flipper category, but it misses the mark by a long shot. As part of a group pass-around I had this knife for a week and spent a few hours with it in my kitchen dispatching various veggies. The critic in me questions having both flipper and Axis locking mechanisms. Give us one or the other please. The blade is too short and stubby, and the while the scales on the original production version have been upgraded, the 300 is a nice try but not very interesting. I'm a guy who is used to carrying Spyderco knives, but have always had a longstanding interest in Benchmade knives. I had just never found a Benchmade that quite suited my taste, until the 300SN. When the 300SN came out, I had to have it. The look was perfect and they finally corrected the "issues" that were not to my taste. Specifically, I was never a fan of Zytel and I find the thumb stud on the average Benchmade to be unusable(I also don't like flicking it open by pulling back on the lock, although I know you can do this). So, let's start with the aforementioned items. The 300SN uses G10 scales, and nicely textured ones at that. The grip is phenominal, in wet or dry. The knife also comes in an attractive coyote brown, which makes it a bit unique in the sea of black g10 scaled knives out there. G10 on a knife always has a higher quality feel to me than FRN or Zytel. The knife feels more compact and robust. Next up is the deployment mechanism. THe 300SN still retains the standard Benchmade thumb stud, and of course you can actuate the lock and flick the knife open, although I find this to be a bit clumsy and require too drastic of a grip change when opening the knife and tends to beat up the lock if you get overzealous with your flicks. 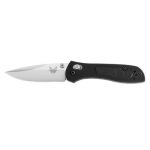 However, Benchmade included a flipper on this knife,which provides a nice balance of usability, minimal grip change when deploying the knife, and control so you don't massacre the lock over time. The jimping on the flipper, as well as the spine of the blade for that matter, is aggressive but not sharp so as to still remain comfortable. The next feature that stands out is the size of this knife. A lot of people make the mistake of springing for the biggest knife they can find, only to realize later that it's cumberson to carry, bulky, uncomfortable, and way more knife than they need. The blade on the 300SN is a few ticks over three inches, fits nicely in the pocket, provides ample cutting edge without exceeding sensible limits, and provides enough handle length to comfortable grip. From a thickness standpoint, this knife is thick. The spine of the blade is north of 1/8" and when combined with dual steel liners and G10 scales the overall knife is close to a half inch thick. I personally like the thickness, as it nicely fills my hand when I hold it and makes it more comfortable for me. The downside is that it fills the pocket a little bit more. This knife is great for me, but I reckon it may be a touch too thick for some people, particularly people who are conscious about weight or people who wear tight pants with small pockets. The lockup is great, as it standard for a Benchmade. The lock is easy to disengage, has a nice detent when closing the blade, and snaps open with a satisfying click when deploying the knife. The clip is a solid two screw design that is held on by torx bits. While it is robust, I would have liked to see a tip down option. This is probably my only complaint about the knife. Actuation on the knife is silky smooth, and I haven't even oiled the pivot yet. The grind on the blade is pretty good, and the edge is razor sharp out of the box. 154CM steel is always a good choice as it rivals the Spyderco standard S30V, so unless you wanted to get exotic with your blade steel you couldn't ask for much better there. Overall Benchmade has presented quite a package here. I have been carrying a Spyderco Paramilitary 2 for the last two years, and while I won't say this knife dethrones the PM2 as my primary knife, it certainly does compete for EDC time fairly often. The quality, comfort, and smart features will leave even the pickiest of knife guys satisfied. The 300SN is a knife that gets my highest recommendation.